Kids can create and code their ultimate pup! 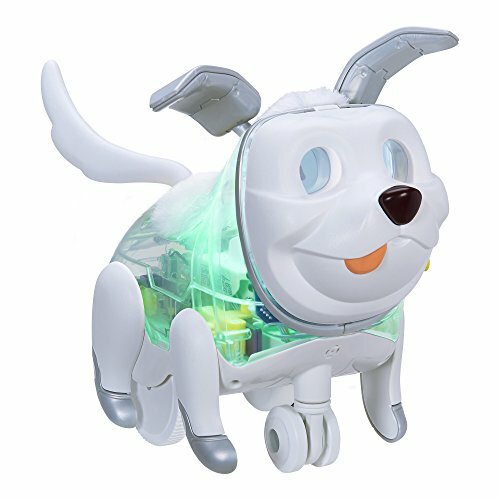 The Proto Max interactive pet can become a customizable pup – kids can customize its personality and responses with 400+ sounds, 100+ eye animations, a wide range of colors, and 360-degree motion. They can even have it do awesome tricks and routines by using the downloadable app. The fun starts the moment kids open the box. They’re welcomed with a furReal Makers guide and intuitive 9-piece build complete with surprising sounds during assembly. With the turn of a dial and push of a button, kids can select its starter personality, including basic sounds, lights, and responses. Next, kids can create and code even more by downloading the furReal Makers app (onto a separate device; not included), They can add depth to their pup’s personality by renaming it and customizing responses to 10+ activation points, and creating tricks and routines through easy drag-and-drop play. Kids can discover more ways to play with the app’s remote-control capability, letting them direct their pup in real time. They can also play games and earn badges with their pup as they feed and nurture it while using the app. furReal Makers and all related characters are trademarks of Hasbro. Hottest Toys of The Year Copyright © 2019.